Whether you’re looking to cut the cord and save yourself some money on monthly cable or satellite bills or simply expand your entertainment options, an on-demand streaming service is a must these days. But which one should you choose? It’s a growing market, with new players joining the space every few months, making what used to be a “Netflix or nothing” decision substantially harder. To make things easier, we’ve compared two of the most popular Netflix streaming alternatives: Hulu and Amazon Prime Video. Each one has unique content, features, and pricing, and unlike Netflix, both Hulu and Amazon Prime Video offer add-on channel packages in case you want more content. Below we’ll pick a winner in each of several categories, and an overall winner. But ultimately, you’ll need to decide which service (or services) best meets your needs. Amazon offers two main price tiers: $119 annually (discounted to $59 annually when you sign up with a valid student email address) or $13 per month. Both versions include all of the Amazon Prime perks, like two-day shipping, discounted prices on select items, cloud storage, and — most importantly for our purposes — on-demand video and music streaming. The best part is that, unlike Netflix, 4K Ultra HD content with HDR comes standard at no extra cost. Plus, you can share accounts with friends and family, so everyone can get in on the deals. You can also supplement Amazon’s included content with optional channel add-ons, such as CBS All Access, for an additional fee. Amazon doesn’t have a live TV streaming service per se, but many of the content providers it has partnered with for Prime Video offer the ability to watch their shows “live” too. Hulu starts at just $6 for the ad-based service or $12 for the ad-free option (which we highly recommend, even at double the cost). Hulu’s options don’t stop there as it also offers a live-TV streaming package similar to Sling TV or PlayStation Vue. The Hulu with Live TV streaming service is $45 per month and includes 50-plus live streaming channels on top of the service’s regular on-demand library, and there are also add-on features like enhanced DVR, for additional fees. However, that can get very pricey very quickly. While Hulu’s $6 tier on its own is technically cheaper, especially for those who want to stream 4K at the lowest possible price, Amazon offers the most value when considering all of its other perks and its complete lack of ads. Amazon has also stated that the company won’t raise prices for 4K streaming. Throw in Amazon’s student discount and it walks away with the win here. Amazon Prime has a catalog of thousands of titles to watch before you add on any premium options like Starz, or Showtime. Plus, Amazon continues to invest heavily in original content, like Jack Ryan and The Marvelous Mrs. Maisel. Where Amazon really shines is in sheer quantity. It has more movies than Netflix and Hulu combined, at with over 17,000 titles as of January 2019. Of course, quantity does not equal quality, and when it comes to ratings, Amazon and Hulu are about on-par, with around 200 “fresh” movies each as judged by Rotten Tomatoes. And of course, if you’re leaving a cable provider and think you’ll miss out on pay-per-view options, Amazon has an extensive collection of new releases available to buy or rent. On the other hand, Hulu, which is owned in part by Disney, has access to an unparalleled collection of TV shows, making it a great choice if what you really want is a replacement for cable TV access to the major networks. Most shows are available the day after they air live on their respective broadcasters, except for CBS, which is not a part of Hulu. It has a decent collection of movies, but you can tell that movies are not the main attraction. We’re going to give this one to Hulu for now, because while it may not be able to match Amazon’s breadth of selection, we think you’ll actually want to watch more of Hulu’s catalog. Both services are available on a long list of devices — too long to list here, in fact. The full lists of compatible devices for each service are available here: Hulu, Amazon Prime. The only real noteworthy gap comes with Amazon, which is absent from Chromecast and Chromecast Ultra. That isn’t surprising considering these are Google’s devices, and the Google Play Store is in direct competition with Amazon. Still, it’s an annoyance to have such restrictions. Amazon does have its own line of streamers, though, including the affordable Amazon Fire TV Stick 4K. Given the near ubiquity of Hulu, it’s the one you want if you’re concerned about having the widest device support possible. Amazon has a scattered interface across devices that’s not very well designed, though it is constantly improving. One point in its favor is that you can browse Prime Instant Video directly on the Amazon webpage and its various apps and it also works great with Amazon’s Fire TV streaming devices. However, these interfaces tend to differ from one another, and frankly, some aren’t as intuitive as others are. Hulu has a relatively intuitive interface that’s much more uniform, offering categories like Keep Watching, TV, Movies, and Kids that make it pretty simple to navigate. You can also add on premium channels like HBO, and shows and movies from those channels will show up on your main interface. For its quick interface and ability to incorporate premium channels, we’re going to designate Hulu the winner. As touched on above, Amazon offers 4K Ultra HD resolution and HDR streaming support, and does so at no extra charge. In terms of video quality that’s huge, and those with high-quality, large TVs (55-inches and up) should take serious note. Hulu can’t seem to make up its mind on 4K. In 2016, it said it would be adding more 4K content, but as it stands right now, there is no support for 4K on any devices. As for audio quality, Hulu is limited to stereo sound for the vast majority of its content, despite the fact that the same shows are available in 5.1 surround elsewhere. Yes, there are select shows and movies that support 5.1, but it’s nowhere near as impressive as Amazon’s 5.1, 7.1, and Dolby Atmos surround sound encoding on select content. Did we mention there’s no extra charge for any of this high-end A/V support? Yup, Amazon wins this one without breaking a sweat. It’s hard to find fresher content than Hulu’s list of TV shows. With few exceptions, each episode will be available within 24 hours of its original airing, and if you’re on the more expensive no-ads plan, you get to watch them uninterrupted, which is worth the one-day wait in and of itself. If you’re not willing to move up to the premium tier ($12 per month compared to the standard $6 fee), the commercials can really get in the way of Hulu’s greatness. Users who don’t move up will have to watch a stream of ads, the number of which has only grown more frequent (and yet, less varied) as the service has expanded. Hulu’s movies are less current, but no worse than what you’ll find on most competing services. As mentioned previously, Hulu has live TV available at $45 per month, which includes live sports and news if you’re willing to pay, while Amazon has “Channels,” which allows you to add select premium channels with newer content. Of course, if you don’t pay for Channels on Amazon (which are pricey to add on), you can purchase the latest episodes, but you’ll end up paying a massive premium that makes it all but prohibitive ($2 to $3 per episode for SD, $3 to $4 for HD, or $40 or more for a “season pass”). 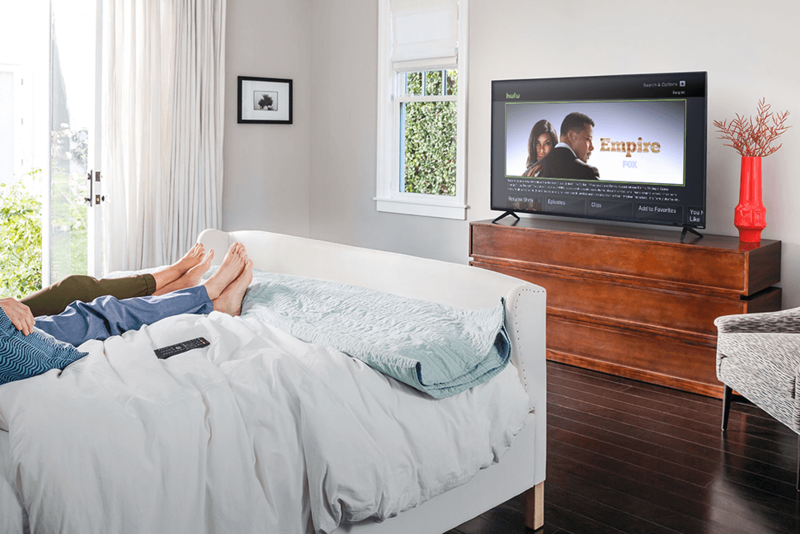 For serious cord cutters who want to stream the latest series, Hulu is the only way to go. Amazon and Hulu have been catching up to Netflix when it comes to quality in their original programming. In fact, one of the best-rated current TV series, The Handmaid’s Tale, is a Hulu original and exclusive to the service in the U.S., ranking among many other options. In addition, now that Disney has taken over the majority ownership, we expect a lot more of the programming the company won’t show on its Disney Plus service to show up on Hulu. As for Amazon, notable content includes highly reviewed shows like The Man in the High Castle, Jack Ryan, and The Marvelous Mrs. Maisel, all of which are worth discovering. In addition, Amazon is spending hundreds of millions of dollars on its new Lord of the Rings series, and Jeff Bezos has deep enough pockets to compete with virtually anyone in streaming. Though neither of these services can hold a candle to Netflix when it comes to original content, we’re giving this one to Amazon because — at the moment anyway — we believe it’s spending more aggressively on new content than Hulu, which bodes well for the future. That said, with Disney taking control of Hulu, this could change quickly. Will the kids be watching? If you need parental controls, Amazon offers a comprehensive set of filters for young viewers, both on its Fire TV devices as well as within Amazon Prime itself. Hulu says it respects the content settings on your device, but doesn’t offer any specific controls of its own. Live TV? Hulu + Live TV is really the only choice between the two services. Amazon’s Fire TV Recast is an intriguing way to acquire free, OTA broadcasts, but it’s not quite the same thing. Sure, you’re going to be paying quite a bit more for the addition of Hulu + Live TV to complement your on-demand content, but the $40 monthly subscription is a fraction of what you would be paying for a normal cable bill. If you’ve already got an Amazon Prime membership, then there’s hardly any contest — you’re already paying for Prime Video, so you might as well enjoy it. You may want to consider adding Hulu’s cheaper ad-supported plan as a quick and easy way to grab some of the shows you might be missing. If you don’t have a Prime membership, however, a no-ads Hulu subscription is our winner. Despite the lack of 4K and better sound formats, Hulu has the kind of content that will please almost any viewer, especially if you like major network TV shows.